Spyderco Raven Knives focus on providing value, variety and high quality. The new BY08G G-10 Raven and BY09G G-10 Crow join the line-up offering two-sizes of high-performance G-10 handled folder at a reasonable cost. As handle materials go, G-10 laminate is grip-grabbing and lightweight while it shakes off temperature extremes, chemicals and hard use without discoloring, warping or peeling. This makes it highly prized for knife handles. Raven and Crow modified Clip-point shaped blades are made with 8Cr13MoV stainless steel. They have a centerline grind and jimping (crosshatching) where handle and blade connect. Jimping gives the thumb and forefinger traction and cutting manageability over the sharpened edge. Running the handle's full length, tucked inside, are steel liners for additional strength and a Michael Walker style LinerLock. 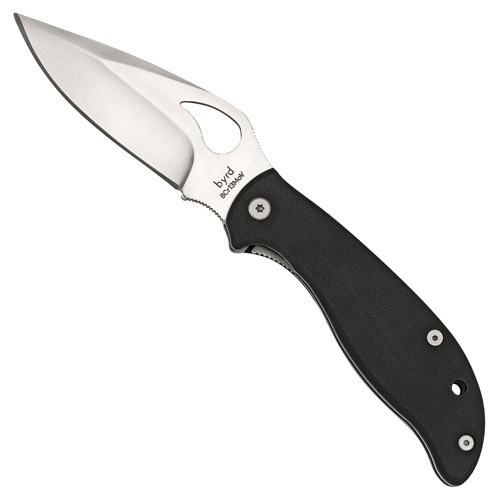 The comet shaped opening hole is a trademark of the byrd knife line and is synonymous with the stringent quality requirements, high performance materials and manufacturing put into each byrd Knife.